It’s been three years since the last Foom Devlog (and since the last major revision to Foom). In that time I helped build and ship the HTC Vive and SteamVR, so I guess being distracted from this side project isn’t the end of the world. Last week on JoCoCruiseCrazy 2017 I had the chance to playtest and revise the game again. This post will be about where it was before the cruise. The next post will be about the revisions I made as a result of the on-board playtests. Here are the cards I started out the cruise with. One of the big problems with taking three years off from your unpublished game is that if you don’t write down the rules, you can forget exactly what they are. That is exactly what happened to me. There was a major revision after devlog #3 and I didn’t write any of it down. I’m going to rectify that “didn’t write the rules down” problem going forward. In the meantime, here’s my attempt to record the rules I started out the cruise playing with. Shuffle the project deck and deal four projects face-up in the center of the table in the “in-progress projects” area. Players will work together to complete these projects and gain the power listed on the project. Each player takes a rule card and the matching worker deck for their color, along with a pile of worker cubes to match that color. Each player shuffles their deck and deals themselves 2 cards. Each player draws one Upgrade card from each phase. These are kept secret so the other player don’t know exactly what their competition is going for. Choose a player at random to start. The unclaimed worker decks and rule cards won’t be used. Set them aside for the duration of the game. Player takes a number of coins equal to their Income. This includes the income from their base rule card, any completed upgrades, and any projects owned by the player. Player draws a number of cards equal to their Draw. This includes the draw count from their base rule card, any completed upgrades, and any projects owned by the player. Play a number of workers from their hand up to the number specified by their Play. This includes the play count from their base rule card, any completed upgrades, and any projects owned by the player. Pay coins to activate any number of powers. This includes the three powers listed on the base rule card, powers on completed upgrades, and powers on any projects owned by the player. A single power can be used any number of times per turn. Discard down to the Hand limit as specified on their base rule card, upgrades, and owned projects. Each worker card has an icon that indicates what kind of worker that card represents. Workers are played on projects to move that project closer to completion. When a player wants to play a worker on a project, they discard a worker card from their hand and put one of their worker cubes over a matching worker icon on any in-progress project. Worker cards with a question mark in a square are wild cards, and allow the player to place a worker cube on an open icon of any type. When the last worker icon on a project is covered, that project is completed. The player with the most worker cubes on the project gains ownership of the project and access to any powers or stat bonuses on the project. If one or more players is tied for having the most cubes, the player who placed the last cube decides the owner among the tied players. At the end of the player’s turn, replace any completed projects with new projects from the project deck. Each player has three upgrades to complete. A player immediate wins the game by finishing their third upgrade. To complete an upgrade, the player needs to acquire projects to match the requirements listed on the upgrade card. When a player gains control of a project that satisfies an upgrade, they immediately complete that upgrade. Players didn’t want to play on projects they weren’t likely to win. My first attempt to solve this was to give non-winning players one coin at project completion for each worker cube on the project. This helped, but wasn’t really enough. 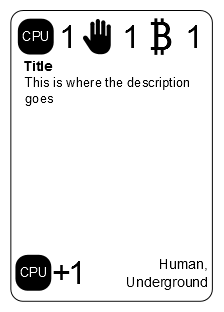 In the later playtest when I eliminated money, I tried “draw one card” for this, but that didn’t work well at all. Player contributions to projects were too diffuse. My solution here was to reduce the number of projects to be the same as the number of players. (I had three players in each of the three playtests I managed to have on-board.) That definitely helped during the early game. It may be necessary to increase that number as the game progresses. Four worker types was too many. Players often went through turns where they couldn’t play a worker because there were no matching open spots. I ran a test with all the gear workers removed from the worker decks, and gear icons on the project cards acting as wild spot that would accept any kind of worker. That seemed to help quite a bit, so I’m going to test more with that rule. Once a player got ahead in upgrades it was hard to catch them. I tried to deal with this by giving any player who hadn’t already upgraded to that level some money, which helped but wasn’t quite enough. Powers that remove cubes (and projects full of cubes) slow the game down. The whole point of escalating capabilities on projects with fixed costs is that the game is supposed to accelerate. The fix here is to change “remove cube” to “move cube to another project”, which means that progress is inexorable. The last phase took way too long to finish. One game took almost two hours, and I’d like the game to be under an hour. I have some ideas here that I’ll test out in future versions. Upgrades that gave extra income were converted to extra draws. A new deck was added (by hand-modifying the purple worker deck) that contained powers. These power cards were added to a player’s worker deck, which introduces something of a deck-building mechanic. A player could play any power in their hand instead of a worker when they made a play. It’s hard to tell what worker type is under a cube, and often powers require knowing that. This is probably going to drive a visual design change in future versions. By the end of the cruise, the cards where covered with scribbles, which is a definite sign of progress being made. Now I just have to go back and turn all that feedback into a new card revision. This weekend’s work on the game happened in three phases. 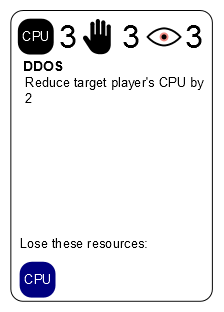 First was some brainstorming about what resources might be involved and how those would be represented on cards. Then I tried to actually “play” two AIs against each other with some proto-rules and proto-cards. After that I had a much better idea what a playable game would be and codified the hand-written changes on the brainstormed cards onto the first thing that could actually be called a “game”. Trick or cajole 3-4 victims into playing with you. Play and tweak the most egregious problems as you go. If your game is sufficiently horrible and stays that way for a long time you might run into problems with step 1, but as long as you’re willing to laugh at how far it has to go that’s not likely to be a problem. The real problem comes with being able to do step 2. If you don’t have a game yet you are going to have a hard time learning anything from sitting down with other people. You’re just inviting some of your friends to brainstorm game ideas with you which may or may not be productive. This is the part of building a new game that I wanted to get through this weekend. Then I printed a bunch of blank cards and started writing down singularity-inspired names that might be useful concepts in the game. The game still wasn’t playable at this point, but that didn’t stop me from trying. I went through the cards I’d scribbled on and starting writing down some rough stats on each one. It was during this process that I started to think it might be useful to have a state that represents the AI’s awareness of the world. 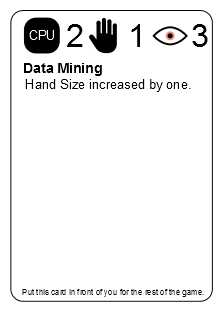 So I started drawing little eyes on the cards and include that as one of the stats. 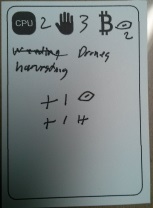 Player draws cards equal to their total Eye rating. Put the card face-down in front of them. These cards can be “spent” on subsequent turns for a value of three bitcoins. To buy a card the player must have stats equal to all three (CPU, hand, and eye) requirements. If the player doesn’t meet a requirement they can spend bitcoin 1:1 to make up the difference. If they don’t have enough coin but have other stats to spare they can spend those stats 2:1 for whatever they need. At the end of each turn the player discards whatever is left in their hand. This kinda worked. It didn’t have any kind of win condition, so the game went on until I felt like I had enough to make another revision. Bitcoin is no longer a “cost” on any card. It’s just used to make up the difference. I started out with a bunch of cards about renting machine time or hiring temp workers but abstracted all that away into exchanging one resource for another. The AI cards come in a stack that lets you level up over time. The first player to hit level 5 wins. The primary way to gain additional CPU is to level up. Most of the other ways seemed a little silly when I actually tried to play them. There are three bitcoin symbols on the backs of the cards to indicate that they count as temporary bitcoin when played that way. All the numbers on the resource counts turned into icons. The PDF is licensed under the Creative Commons Attribution-NonCommercial-NoDerivatives license. Feel free to download it and give it a try. I haven’t actually tried to play it myself yet, so I make no guarantees about fun.